Citizens in Tooele can now use their iPhones® and Android™ based smart phones to send anonymous crime tips to the Tooele Police Department. 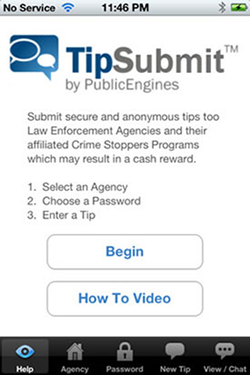 For the first time, iPhone® and Android™ phone users can provide anonymous crime fighting tips, including smart phone photographs and video, to the Tooele City Police Department. The service, called TipSoft, allows citizens to send anonymous tips online using a custom “App” from a mobile phone.The widespread use of smart phones makes it easy for the public to help law enforcement agencies fight crime. With the TipSoft apps, they can know that it’s safe for them to do the right thing without ever disclosing their identity.